I’m pretty excited. This week, after a whole year of suggesting, asking, pleading….I have finally managed to get myself a banana plant for the backyard. It is no secret that we are a family that are pretty fond of growing as much produce as we can manage to eat, and at the moment I can see a huge discrepancy between the amount of bananas we eat (approximately 5 kilos a week) and the amount we produce (a big fat ZERO). What’s more, I have discovered that bananas have plenty of health benefits not just from the yellow fruit, but from the stem, the leaf and the flowers as well. 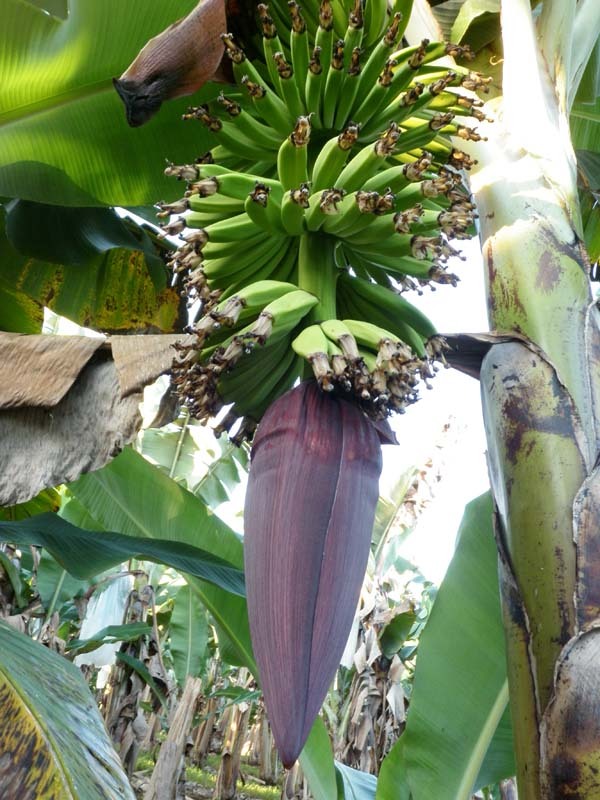 The banana plant produces large pinkish/purple buds from the heart which develop into tubular, white flowers. The blossom hangs at the end of the cluster of bananas. On occasion I have seen fresh banana flowers (complete with cluster of bananas) in the Sydney Flower Market, but it is a rare treat. Banana flowers are often used in Asian and South East Asian cuisines, almost in place of a vegetable in curries, soups and salads. The banana flower is sometimes compared to an artichoke in terms of its texture and taste, and like the artichoke, both the fleshy bracts and the heart are edible. Banana flowers are a rich source of Antioxidants, Vitamin A, Vitamin C and Vitamin E, Potassium, Magnesium and Fibre, making them an excellent food choice. Antioxidants are essential for health because they reduce stress on cells throughout the body and therefore help slow down the ageing process. Magnesium is said to help reduce anxiety and boost your mood, so for those of you who like to eat your way to health, they are a natural anti depressant. Magnesium also helps promote restful sleep. Potassium is fuel for the brain, so helps with concentration, making you more receptive to learning. It has been shown to be an effective remedy to high blood pressure, and has been linked to a reduced risk of heart disease. Fibre is an important addition to any diet (both soluble fiber and insoluble) as it helps make digestion more efficient and reduces the instances of constipation. Banana are pretty much a super-food for women throughout various stages of life. 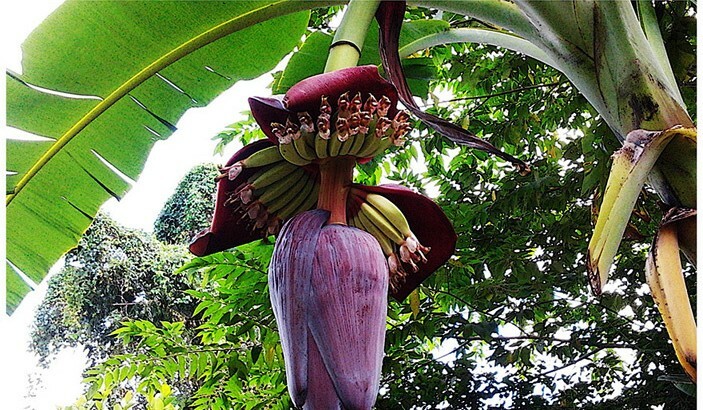 Cooked banana flower combined with yoghurt or curd is said to be one of the most effective home remedies for treating excessive (and painful) bleeding throughout menstruation. The unique combination increases the level of progesterone in the body which has been shown to help reduce bleeding. The Banana fruit is also rich in folic acid (required for making blood) making them a great choice for pregnant women who have increased requirements. On top of that, the bananas high iron content assists in preventing anemia keeping both mum and bubs healthy throughout pregnancy. Nursing mothers can sometimes struggle with milk supply and Banana flowers have been found to boost milk supply 😄 Any new mother knows making time to eat properly when you are tending to a new baby can be challenging. Bananas are the original ‘100 calorie snack food’; the perfect food on the go! With only 100 calories and high fibre, they will keep you feeling fuller longer. Now, I’m under no illusions, one banana plant for my hungry tribe is probably not going to be enough, but it’s a start anyhow! And while this list is not exhaustive it’s clear to me, that bananas are certainly a good choice for the garden or your shopping trolley. 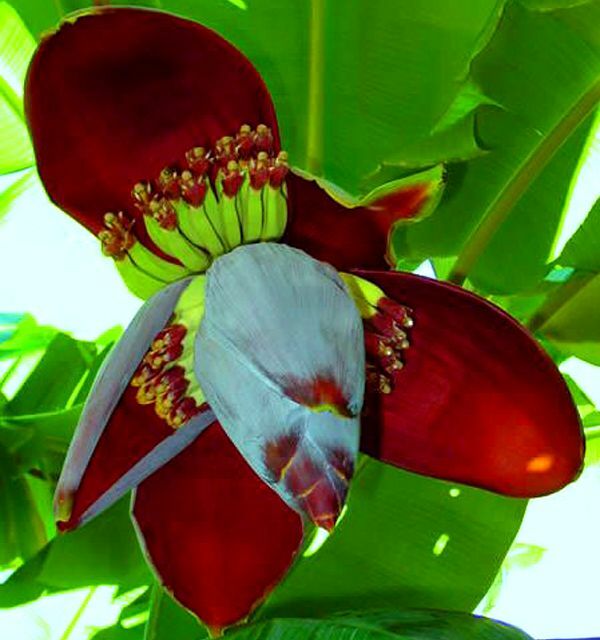 Bananas are of course readily available, and Banana flowers can sometimes be found in Asian supermarkets. 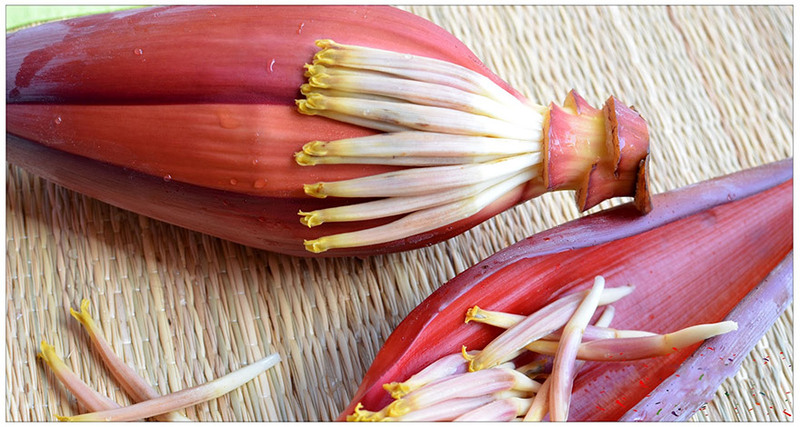 If you are ready to experiment check out this Banana Blossom Salad recipe. When you think of a flower blossoming and coming into full bloom, you conjour up images of soft layers of petals and a sweet fragrances that dance through the air. But the so called ‘corpse flower’ is quite a different specimen of flower. 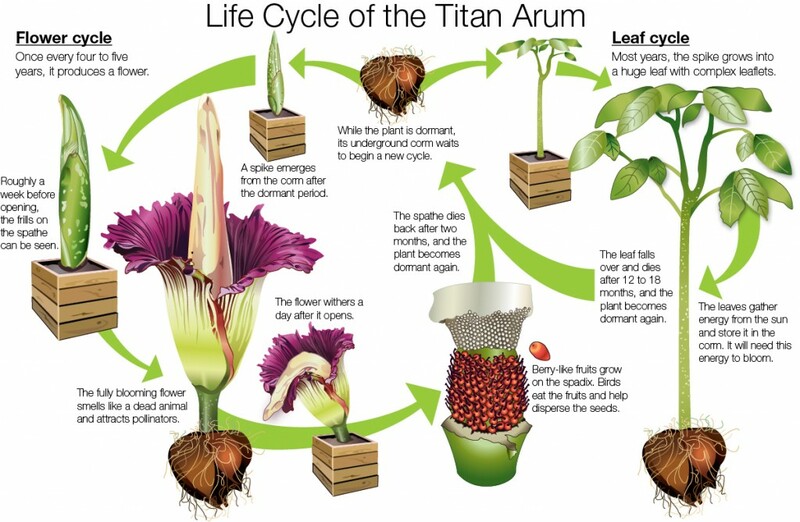 The Titan arum (Amorphophallus titanum), is a rare bloom that only flowers approximately every 3-5 years with a pungent odour likened to the smell of rotting flesh. Delightful. Amorphophallus titanum, a plant native to the rainforests of Sumatra, is a member of the Arum family. It is listed on the IUCN Red list of Threatened plants, noted as being ‘Vulnerable’. 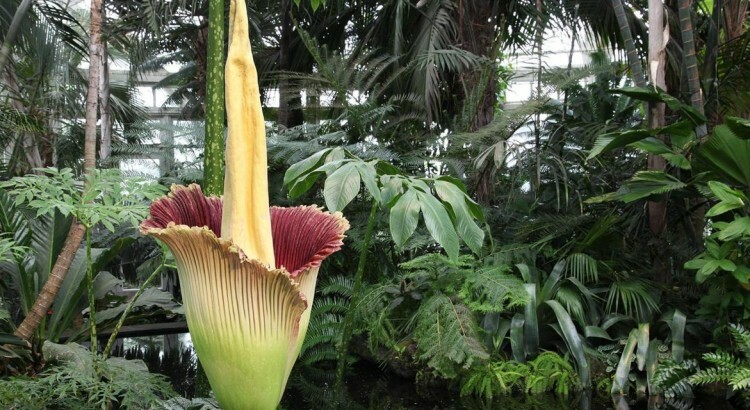 The plant produces the world’s largest unbranched inflorescence in the world, with the flowers measuring up to 3 metres high and 3 metres in circumference! 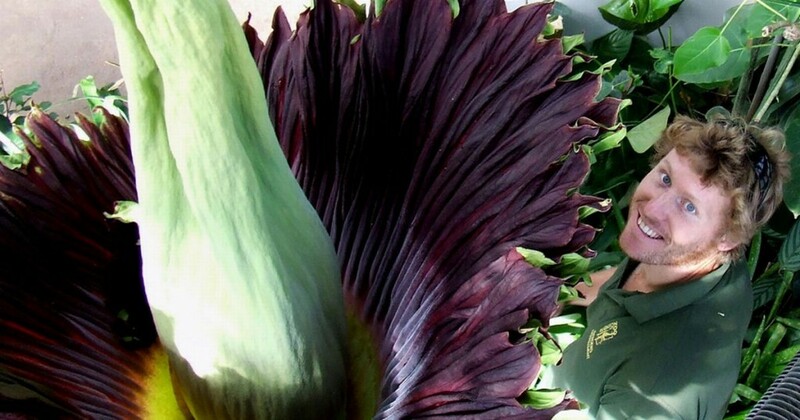 The bloom appears green, however has a richly coloured flesh inside, with ribbed sides and a frilly edge. Right now, there are a few of these blooms expected to open at some prominent gardens around the world. In the Greater Des Moines Botanical Center, Iowa, an approximately 4 foot flower is about to bloom. This bloom is expected to open on or around July 22. For those who are unable to make the trip or perhaps are curious to see it open, but not endure the accompanying odour, the Botanical Centre has opened up a live feed that you can check out here. 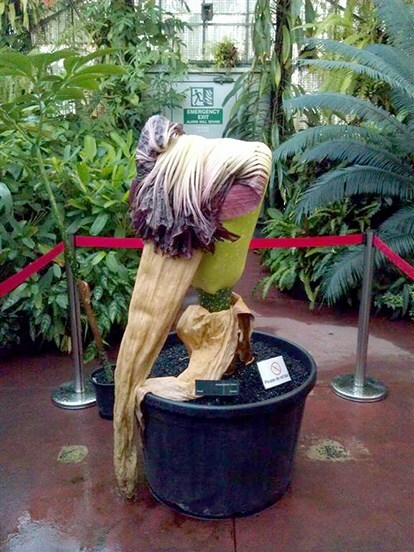 The Paignton Zoo, Devon, UK, has just endured (errr….enjoyed) one of two resident Titan Arum plants opening. The second plant is expected to bloom just a few weeks behind. 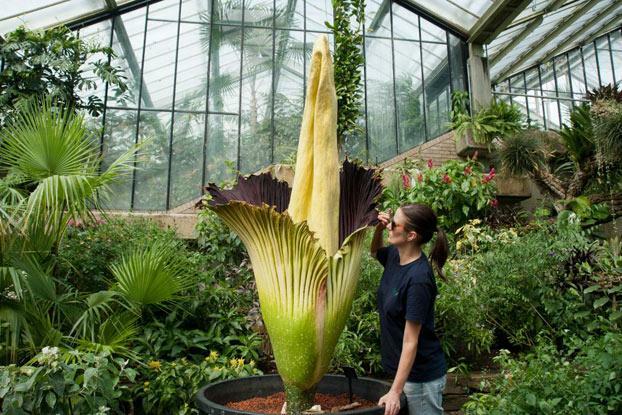 When the second plant was recently repotted, it weighed in at a whopping 56kgs, leaving the first plant to be dubbed ‘Tiny Tim’ in comparison to this giant at the Zoological and Botanical Garden. Image; The Mirror, The Paighton Zoo Titan Arum photographed with a staff member. ‘Carrion’ is defined as; ‘the decaying flesh of dead animals’. So Carrion flowers are flowers that emit an odor that smells like rotting flesh. The flowers ‘scent’ wafts through the air (particularly at night) attracting flies and other pollinators. There are several Carrion flowers, the Titan Arum lily has a few smelly mates within this category, but the blooms are not necessarily related species. 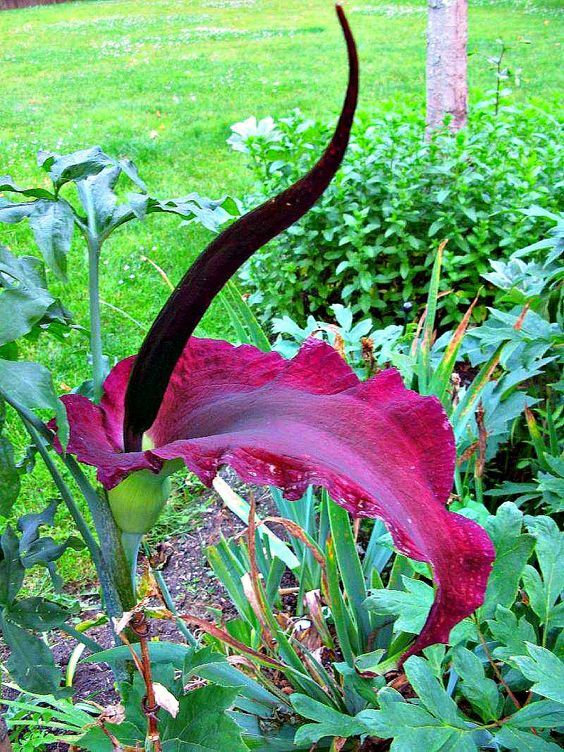 The Rock Island Quad City Botanical Centre has a Voodoo lily in residence which also omits a foul scent, and this blooms in late January. What do they say ….”Live fast, die young, and leave a good-looking corpse.” I’m not sure that any of these Carrion flowers are the most attractive blooms on offer, but when something blooms so spectacularly (size- wise), so infrequently (every 3-5 years) and so fleetingly (living only 24 hours) is certainly still gets on my bucket list. Have you ever seen a Titan Arum? Everyone these days is on the look for something new, something fresh, something different. We want everyone to want what we want- almost as if their reassurance will tell us we are on the right track. Everything about today is geared towards standing out, and gaining approval- that is the way social media appears to be working right? So in a world that is forever trying to come up with the next big idea, design concepts like this one, are sure to impress. 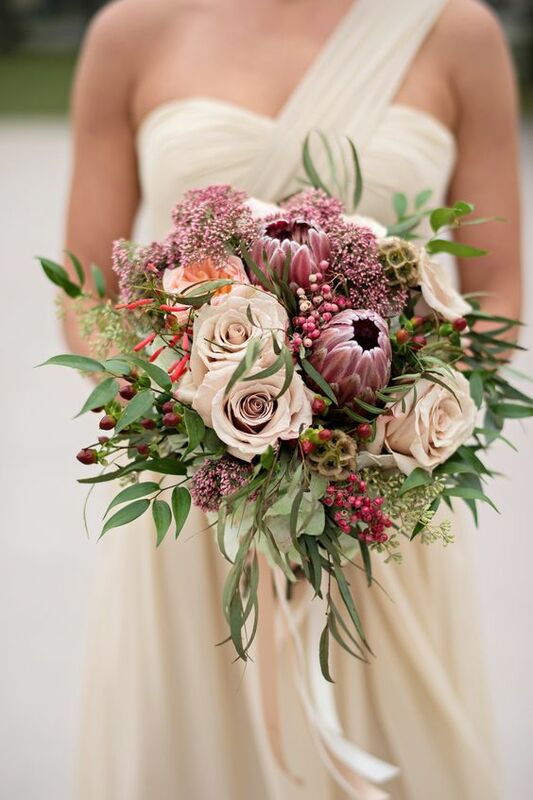 A simple vase of fresh cut flowers certainly is beautiful and an attractive pot with a lush green plant will definitely help bring the outdoors inside but we have all seen that before. Have you seen this innovative design that I stumbled upon? We all know how magnets work; opposites are attracted to one another, and therefore pull most strongly together. And poles of the same origin will repel. Magnets and magnetic force is almost like some special type of magic- stuck together like glue, or repelled. Well, this concept has been utilised to create a unique plant concept, whereby the planter hovers over the decorative base via magnetic levitation. 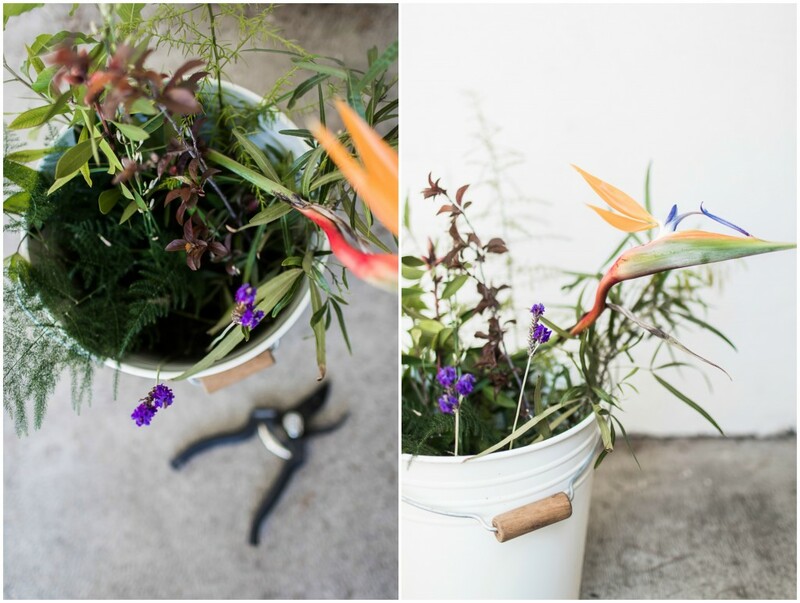 The plant is gently rotated to expose the plant to sunlight, which is essential for the plants survival. There are a few companies offering variations of the concept which begun crowd funding a few years ago via kickstarter. Bases are available in modern chrome finishes as well as lovely rich oak, or bases covered in pieces of wood that have a more rustic finish. Air plants such as the Tillandsia do particularly well as they are able to absorb the nutrients from the atmosphere. The rotating action allows the plant to be evenly exposed to sunlight. Bonsai plants are another option on offer, as are some palm varieties. 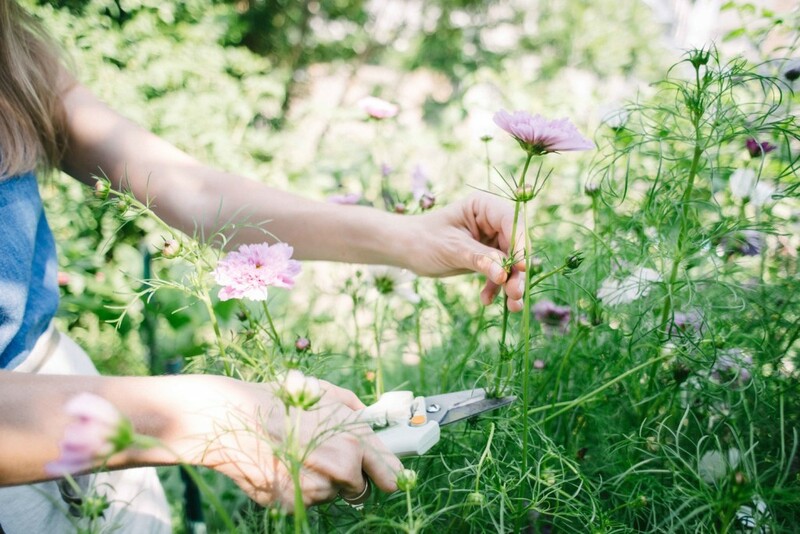 Initially, D.I.Y kits were also available so essentially you could plant whatever you like. The ‘little star’ plant base as it is called, is made of a unique super absorbent sponge like material which holds water so the plant does not dry out. With time the plants roots will fully anchor themselves to this base, making it stable and secure. The decorative base that sits on your table/counter etc does require power. It’s a pretty futuristic concept, and certainly something that would look out of place in my home- but how cool is it!? It’s a gorgeous idea for minimalist homes, a fantastic house warming gift, or a gift for someone who has just about everything. 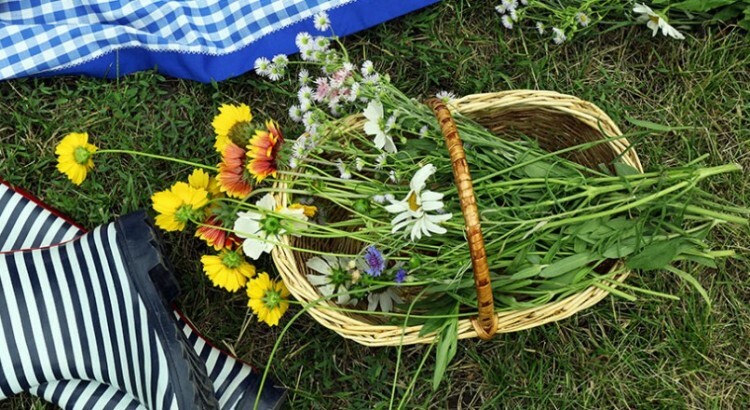 But if it’s not for you, you can still stick to a gorgeous fresh flower arrangement presented in any vessel you choose, and guess what, it won’t require power either.